Kayrock offers 1-3 month internships for currently enrolled undergraduate students who are interested in learning about screenprinting and design. I want to say a big thank you to all of you for an internship experience that surpassed all my expectations. This summer I learnt about printing, binding, framing and print shop management but best of all I got to develop relationships with all of you. Through conversations with you all I gained knowledge about the printmaking industry and the art world in general. You connected me with resources and contacts, and really boosted my confidence as I look towards beginning my career after graduation. I am very proud of the work I was able to make at your studio and feel inspired and energized to create more prints this semester. I will definitely be recommending your internship program to fellow students here at UNC. I couldn’t have asked for a better place to spend my internship in my last school semester. The staff is so awesome and so helpful and they create the coolest stuff! I learned so much about printing processes and was able to work on some of my own work as well while helping out around the studio. For my Fine Art FIT thesis show I used the studio to screen print on small pieces of wood and leaves which surrounded some oil painted pieces of wood. They really helped my final project come together and I couldn’t have asked for a better outcome! After printing on wood I used my same mandala design from the wood and made some really awesome bandanas, as well as printed a new design on shirts! I am so appreciative of the help I received which allowed me to be able to experiment with different colors, and with the metallic foils. Overall I am beyond happy with the new screen printing knowledge, experience, and prints I was able to take home with me after my three months at Kayrock! To be completely honest, working at Kayrock was the best internship experience that I've ever had! I would bike from my house on the Upper West Side to Greenpoint nearly every day that I worked. (Except when it rained or I wanted to bring my skateboard to skate at Mccaren Skatepark after work.) It was a really great workout and adventure. Everyone at Kayrock was so nice and helpful when working on my solo project or when I had questions about the work they had me do. My daily tasks included: cleaning out / reclaiming screens, putting emulsion on screens, book binding, unloading the racks, catching shirts that came out of the curing belt, packaging greeting cards, and prepping the stock for fairs. 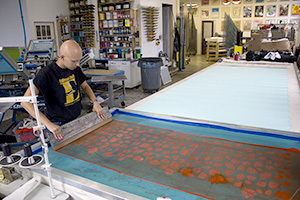 I got to learn the process of book binding, wood frame building in the wood shop, and how to work with plastisol inks. 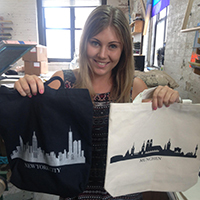 I also learned how to screen print on various materials like bandanas, tote bags, hoodies, and notebooks.